This is a task we had to do for CATS, the brief was to pick an image from a game of your choice and analyze it within 500 words. This is the first version of it without any feedback so its a bit of a rough draft. This is an image from Fallout 3 an open world RPG developed by Bethesda game studios and it’s the third game in the fallout series and was released October 2008. The reason I have chosen an image from fallout 3 to analyse is that it’s one of my favourite games ever still to this date and to me felt ground-breaking, personally I had never played a game like it and immediately got addicted to the free roaming and do what you want when you want gameplay. 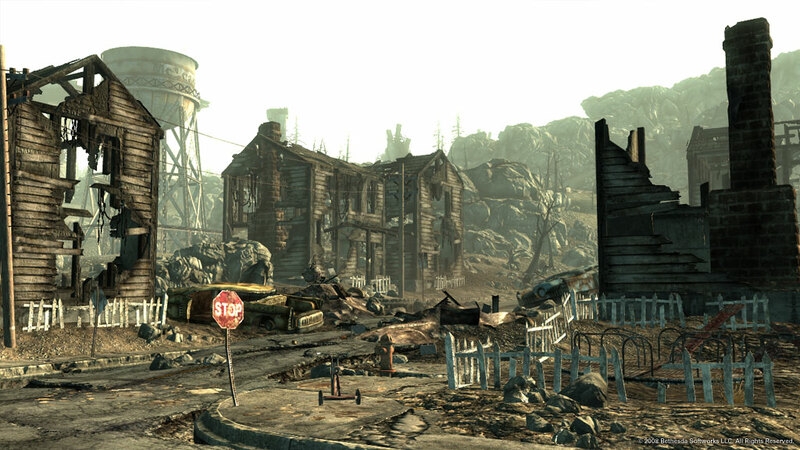 More specifically the reason a chose this image from fallout is because it’s an iconic image from the game, it’s the first little town (uninhabited) you go to after leaving the vault where you have lived all your life so have no knowledge of the outside world. And sets up the game really nicely for what you will see in the future. In the actually image you immediately can see there has been some sort of nuclear war or disaster and it’s the initial thing you notice about the image. You can see this has happened because of the debris, destroyed buildings, destroyed cars etc. You also think a nuclear war or disaster has happened because of the lack of vibrant colour and life, , the most vibrant colour you actually see is the red on the stop sign but that’s even worn and faded. And you don’t see any green plant life what so ever or any sign of life at all, but you can see some tree’s but they are all dead so it shows there previously has been life, it’s mainly dull browns and greys in the image. So straight away from the first 15 seconds of seeing this image you get an initial thought of what the game will be about and what has happened in the past and what the place was like before. When looking at the image for a bit longer you also notice the 1950’s American feel to it, which I mainly noticed from the cars looking old fashioned. You can imagine it before the nuclear war as a clean cut typical suburban American town with the white picket fences, everyone’s lawns perfectly mowed, everyone knows each other and is friendly to each other and the kid’s playing on the tricycle and on the merry go round. It makes you feel before the nuclear war that it was a utopian type of place, which gives you a nice contrast from the dystopian place it is now. In the background you can see a water tower that is still standing and not destroyed which is different to the buildings which are all collapsing and decayed. So has it been rebuilt? has it just survived the nuclear war?, And is it still in use? Is the water drinkable? These are some of the question you think about when looking at this image more in depth. Also in the background it’s very mountainous and looks like it would be difficult terrain to navigate and from a game developer’s point of view I wonder if you can go beyond that point or if that is the limit of the game.